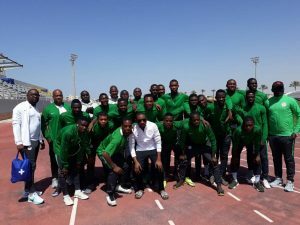 U-20 AFCON PLAYOFF: Flying Eagles Hold Mauritania – Royal Times of Nigeria. Nigeria’s Under-twenty side, the Flying Eagles were held to a one draw by Mauritania in the first leg of their Under-twenty Africa Cup of Nations second round qualifying tie at the weekend. Niger Tornadoes star Ibrahim Babawo opened scoring for Paul Aigbogun’s men in the 25th minute of the encounter but the hosts equalised four minutes later. The Flying Eagles wasted several chances in the second half but now have the advantage after grabbing an away goal in the clash. The return leg will be played in at the Agege Lagos next week Saturday with the overall winners advancing to the tournament proper in Niger next year.